Philadelphia Flyers center Travis Konecny. If there is one player this season who embodies the Flyers it has to be forward Travis Konecny. Generously listed at 5-foot-10, 185 pounds, the Flyers' 2015 first-round draft pick can look stunningly brilliant one moment, with his explosive speed and a sharp shot, and baffling the next — much like the enigmatic team he plays for. Take Thursday night' 4-3 victory over the visiting New York Rangers, where the 21-year-old Konecny scored two Flyers goals and spent much of the third period mired on the bench. He only had four truncated shifts and 2 minutes, 28 seconds of ice time after coach Dave Hakstol grew fed up with Konecny’s lack of defense and penchant for turning over the puck. 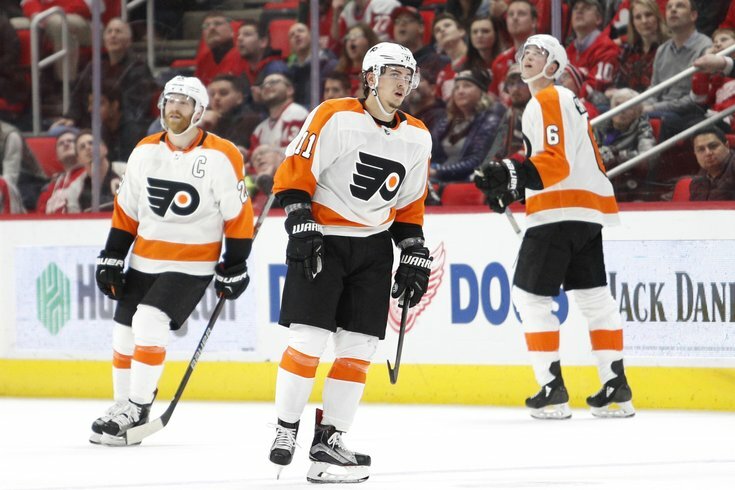 Beating the Rangers was a crucial victory that enabled the Flyers to continue its hold on the first wild-card spot in the Eastern Conference playoff race with 88 points. So the young forward didn't disagree with his coach's decision. “It’s just about getting the two points," Konecny said when asked why his ice time was cut down in the third against New York, when the game was still close. "We’re going to make sure that defensively we’re going to take care of the pucks, little things like that. It’s part of doing things for the team and I have no problem with it, it’s a matter of getting the two points." With seven games left, the Flyers are 38-25-12 and hold a six-point edge over the second wild-card team, New Jersey (82 points, with nine games left), and a comfortable seven-point difference over playoff contender Florida (81 points, with 10 games left) looking from the outside in. The Flyers are only one point behind Pittsburgh (89 points, with eight games left) and Columbus (89 points, with seven games left) in the Metropolitan Division standings and three points behind division-leading Washington (91 points, with nine games left). And despite his turnovers and defensive struggles, Konecny, who has 22 goals and 22 assists in his second season, is a large reason for where the Flyers are. The first-line right winger’s goal output is fourth on the team, behind Sean Couturier (30), Claude Giroux (26) and Wayne Simmonds (23). His plus-minus is a plus-16, which is third, behind Couturier (plus-26) and Giroux (plus-18). His six game-winning goals are tied for first on the Flyers, shared with Couturier. He’s scored 16 goals in the Flyers’ last 30 games. Yet, out of the top eight point-producers for the Flyers, Konecny’s shifts are dramatically different from the others. He has played the fewest shifts, 1,447, with the next closest Flyer among the top eight scorers being Simmonds, who’s played 1,563 shifts because he’s appeared in six fewer games (Konecny’s 74 to Simmonds’ 68) due to injury. Konecny’s average minutes per game, 14:45, is almost two minutes fewer than third-line center Valtteri Filppula (16:33). When he plays a north-south, straight-line game, and doesn’t try doing too much, Konecny is dangerous with the puck. But, as his coach was quick to point out after the game, he can also be a liability on defense. That's why Konecny saw just 21 shifts and 12:29 of ice time against the Rangers, his second-lowest total this month, only surpassed by the 11:19 he played in the Flyers' 6-3 win over Washington on Sunday. And in the third period, with the game on the line, Konecny was hardly on the ice after being replaced by fourth-line winger Matt Read. His absence elicited a “Wait … What?” moment. But maybe it shouldn't have. After all, Konecny has known for a while that he needs to improve in certain areas. Recently, he even felt he was trending in the right direction thanks to a conscious decision to simplify his game and not trying to do to much. “I think I’ve narrowed my game to where it’s effective for me and the team," Konecny said a few weeks ago. "This is good for me, I’m learning a lot. Honestly, I’m trying to play as safe as I can and as smart as I can and gain the trust of the coaching staff. Things like good defense leads to good offense, everyone says it, and cliché, but it seems to be working. It’s now late March and with the end of the regular season closing in it’s beginning to look like Konecny is running out of “next times.” Konecny wants more ice time in key moments, but until he places more focus on protecting the puck and being more of a two-way player, he's not going to earn Hakstol's trust. In the meantime, that means watching crucial moments from the bench. "If that’s the way we have to win," Konecny admitted Thursday, "then we have to do it every time."